Who can resist an antipasti platter when they include marinated mushrooms, Orange Marinated Olives, and Marinated Roasted Bell Peppers? The only thing better is when these appetizers are served with a wonderful Italian crusty bread! Have you ever noticed how marinated mushrooms are always the first to disappear when they are part of an antipasti platter? 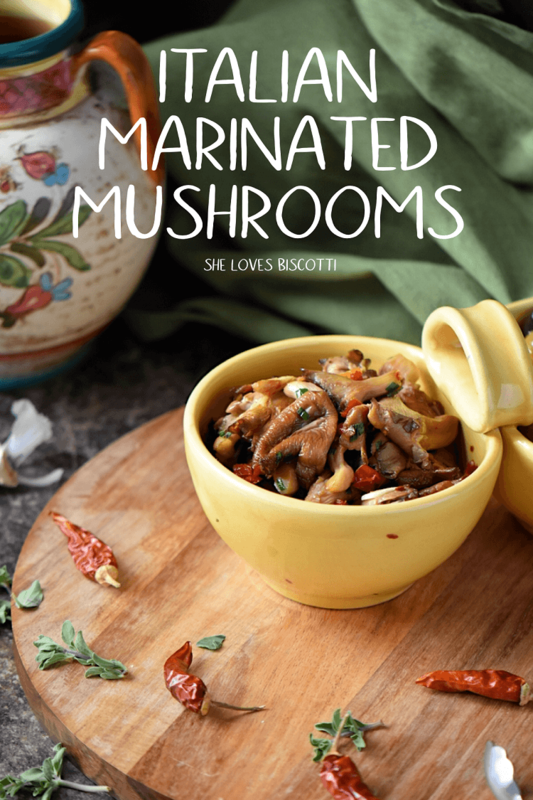 Have you ever wondered how to make marinated mushrooms? Well, today is your lucky day! It’s a lot easier than you think. In fact, the hardest part about making marinated mushrooms is cleaning them and once you get the hang of it, even that isn’t difficult. If you make a batch today, it will be ready for you to share with your family and friends this weekend… here’s how! As you can see, I will be using some beautiful oyster mushrooms for this marinated mushrooms recipe. 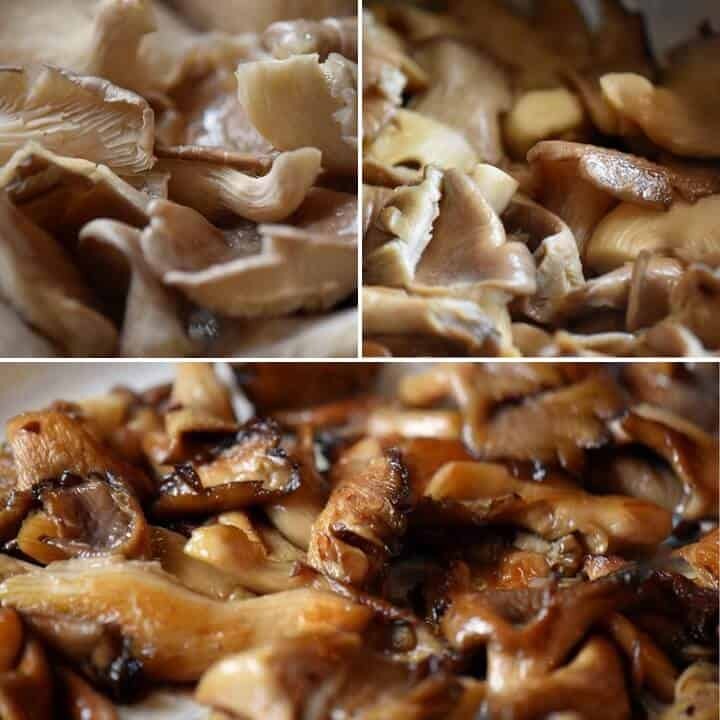 Feel free to use other varieties of mushrooms that are readily available to you such as cremini or button mushrooms. With a sharp knife, remove the individual mushroom caps from the central stem. Cut off up to half of the stem as the part close to the central stalk is usually very rubbery. Both the central stalk and the rubbery cut off stems can be used to make vegetable stock. Wipe the caps and gills clean with a brush to remove the visible dirt and any insects. A slightly moistened tea towel can also be used. The mushrooms can also be rinsed (very quickly) under running tap water. 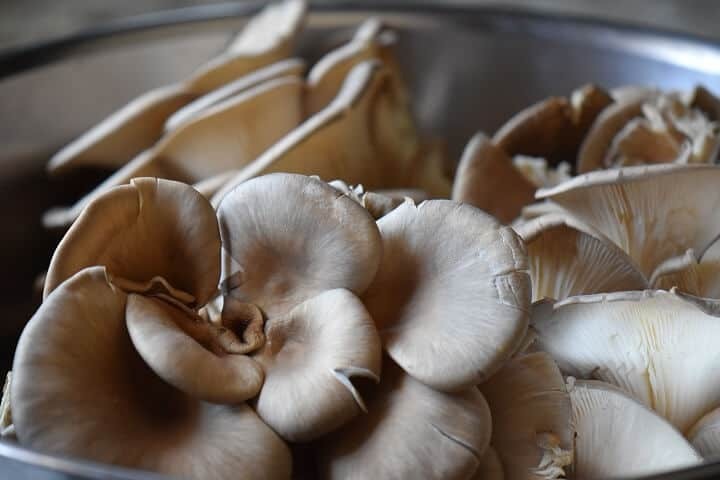 Thoroughly inspect your oyster mushrooms for any dirt or insects. Allow the rinsed mushrooms to air dry for about an hour. Tear apart or slice the larger mushrooms so that the whole batch is uniform in size. In a large skillet, over medium-high heat, add about 4 tablespoons of olive oil, a pinch or so of red pepper flakes and about 1/4 teaspoon of salt. Once the oil gets hot, add the mushrooms and about 2-3 tablespoons of lemon juice. Stir frequently. It will take about 10-12 minutes for the mushrooms to get caramelized and brown around the edges. Remove the mushrooms from the heat and resist the temptation to eat them all 🙂 Spread them out on a large baking sheet and allow to cool down to room temperature. While waiting for the mushrooms to cool down, combine the sliced garlic, fresh chives, dried tomatoes, and oregano in a glass bowl; add the mushrooms and combine thoroughly together. Cover with plastic wrap and refrigerate for at least 8 hours or up to one day. When ready to serve, remove from the refrigerator and allow to stand about one hour at room temperature; drizzle about 1 tablespoon of olive oil and 1 tablespoon of lemon juice. Adjust salt and pepper seasonings to personal taste before serving. Nutrition Note: Mushrooms are low in calories -one cup (uncooked) has about 20 calories. Mushrooms will also provide a unique combination of vitamins, minerals and antioxidants, depending on the variety. 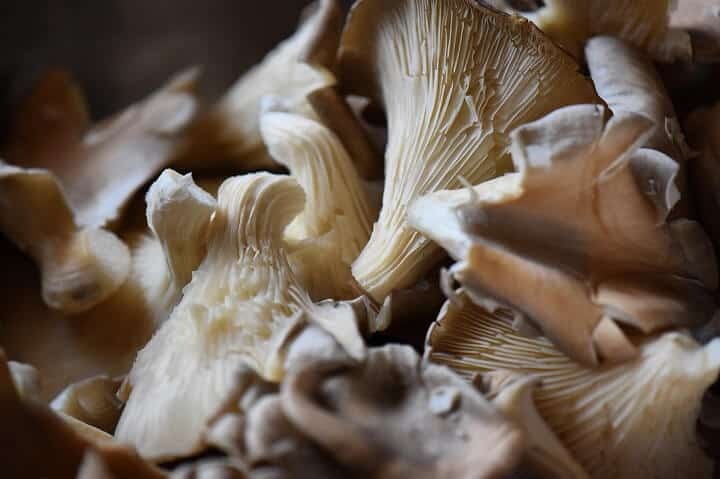 If you are interested in knowing more about mushrooms, this site is both informative and offers some great mushroom recipes! I have no doubt that my love for mushrooms stems from my childhood. I can still remember when my dad would pile the three of us in the car and drive to his “secret spot” to bring his kids mushroom hunting or as he would say “andare a funghi”. Mushrooms would often be used by my mom as stand alone sides or as a key ingredient in a recipe. There was never a shortage of mushroom recipes -whether baked, stuffed, sauteed, grilled or stir-fried, they would always be appreciated. One popular recipe was my mom’s marinated mushrooms. Please note that in this particular recipe, I used oregano because my backyard oregano was already available. My mom would always use parsley. That being said, you can use any herb -parsley, oregano, thyme, or even basil. I would recommend only using one distinct herb as this truly brings out the earthiness of the mushrooms. I would also like to mention that my mom would always include freshly chopped red pepper in her recipe. I still had some of my Sun-dried Cherry Tomatoes and so that is what I used and I just loved how they turned out. Once again, feel free to use red pepper if it is readily available to you. These Marinated Mushrooms are definitively a great addition to your charcuterie board or as mentioned, your Italian antipasti platter. Enjoy! 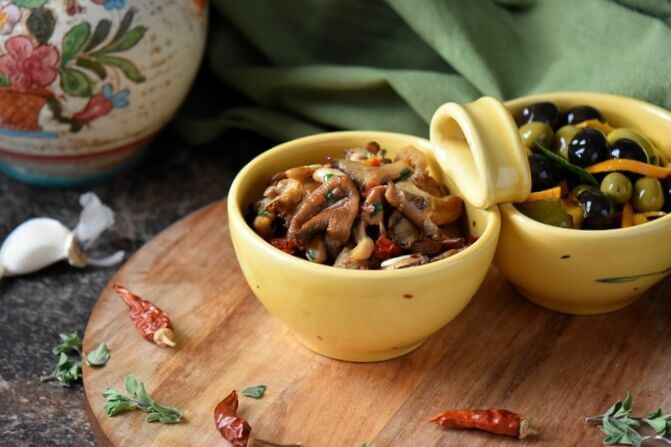 If you have made this Marinated Mushrooms recipe, I would love to hear about it in the comments below and be sure to rate the recipe! 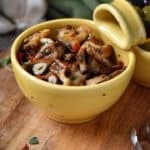 These crowd-pleasing Italian Marinated Mushrooms are the perfect addition to your antipasti platter -such an easy appetizer to make and enjoy! You will also love the convenience of preparing them before your planned event. In a large skillet, over medium-high heat, add 4 tablespoons of olive oil, a pinch or so of red pepper flakes and about 1/4 teaspoon of salt. Once the oil gets hot, add the mushrooms and about 2 tablespoons of lemon juice. Stir frequently. Cook the mushrooms for about 10-12 minutes. Mushrooms are done when they are caramelized. Spread them out on a large baking sheet and allow to cool down to room temperature. Meanwhile, combine the sliced garlic, fresh chives, dried tomatoes, and oregano in a glass bowl; add the mushrooms and combine thoroughly together. Cover with plastic wrap and refrigerate for at least 8 hours or up to one day. When ready to serve, remove from the refrigerator and allow to stand about one hour at room temperature; drizzle about 1 tablespoon of olive oil and 1 tablespoon of lemon juice. Adjust salt and pepper seasonings to personnel taste before serving. 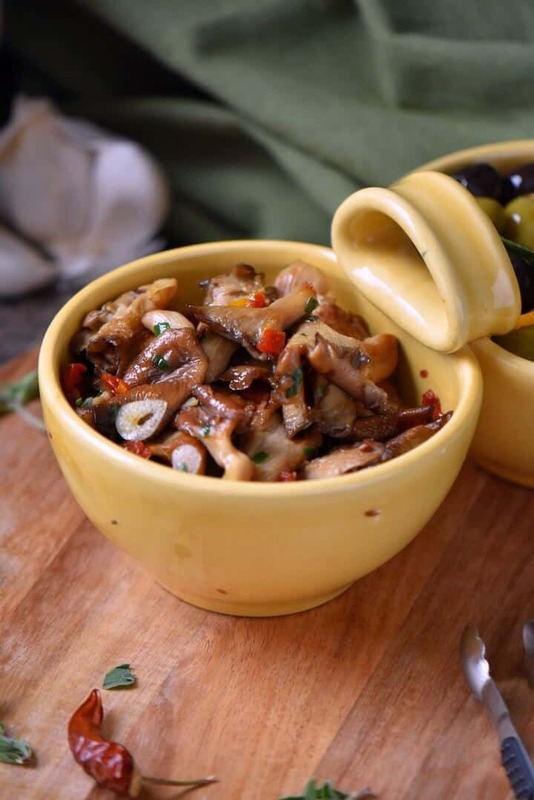 DO YOU LOVE THIS MARINATED MUSHROOMS RECIPE? Your website is incredible! Congratulations! I will certainly refer to it more often as I retire and even now. With my son getting engaged I was looking for the perfect amaretti recipe, I have one now. All the best to you. I lived in sicily (catania area) for 4 yr, then rome for 2… but in sicily the food trucks (panini) that came out at night to feed the kids after the clubs (but also at some other panini stands) had this marinated, spicy, mushroom topping that u have never been able to find or replicate. I am wondering if u could do research and find out what and how its made? This was in the late 90s. Yours is the first recipe i have found and will certainly try it, but it doesnt LOOK the same and the shrooms are def different. Any help would be amazing!!! Ciao for niao! I love every kind of mushroom, and these look so delicious! Pinning to try this recipe, can’t wait! I have never marinated my own mushrooms. They must taste excellent! Thank you for this recipe, I want to try it! I love serving marinating mushrooms as part of an antipasto platter. I really like the idea of adding dried tomatoes to the mixture…thank you for the suggestion. Love this- ideal for the dog days of summer along with a few other nibbles. I have not marinated using oyster mushrooms, thanks for the prodding to get me out of my rut.